You don't have to rob a bank to get married in paradise! This also includes pick up for the bride and groom from the hotel, villa, or cruiseship dock, driven to the courthouse to pickup the license then on to the ceremony location, and of course back again after the wedding in a 2016 luxury SUV with lots of legroom. The trip to the courthouse is only included if it is on the way to/from the wedding. If you want me to take you to the courthouse any other time other than on the way to the ceremony a $100 fee applies. If you are not adding photography please be sure to bring a fully charged nice camera with lots of storage and I can take some pics with your camera for free, believe it or not I can officiate and take pictures at the same time. St John couples will need to come back to St Thomas on their own to get the license. There is a Charlotte Amalie ferry that drops you off within a 100 yards of the courthouse, and it only takes about 10 minutes to pickup a license, its very easy. The Charlotte Amalie ferry leaves St John at 8:45am and 11:15am and returns at 10am and 1pm which will leave you enough time to get the license since it is a very quick and painless process. However, if you arrive at the airport before 4pm I would strongly suggest using the $100 concierge service as it will save you a half day of having to trek back to St Thomas as well as taxi and ferry fees which will add up to around $100 any way. If you are renting a car while on St John I would recommend renting it on St Thomas and bringing it over to St John on the car ferry, that will allow you to stop at the courthouse, check out St Thomas a little and you won't have to load and unload your bags multiple times. For car rentals with amazing service and no waiting in lines contact Leah leah@pdise.com avoid Dollar and Thrifty at all costs. Our taxis at the airport are shared taxis so they make multiple stops and they will not wait for you to run into the courthouse, plus those drivers are a little rude and it can be a little chaotic. $100 Airport concierge service, a driver will greet you at the airport, drive to courthouse to pickup license, then onto your hotel or ferry with a tour along the way in luxurious SUV. If you need anything else like waters, rum punch, cake, etc. please don't hesitate to ask! This is for the adventurous and casual brides (see picture above). This includes officiant, boat captain, and boat (see picture below) for the day including the gas. From as early as 8am to 6pm you can make a day of the wedding on the water. From getting married on an deserted island with wild chickens and donkeys as your witnesses, then snorkeling some of the best spots in the Virgin Islands then hopping over to the British Virgin Islands (passport/birth cert required for entry into the BVIs) to celebrate and have a fresh lobster reception and hang out in a hammock on world famous White Bay on Jost Van Dyke while sipping on a painkiller. Life doesn't get any better than that. This is for casual brides because many of the places do not have docks so jumping of the boat in ankle deep water is necessary, and the location is dependent on weather. The boat is stocked with ice and water, and beers. If you are more formal then let us know and we will be sure to have the wedding on an island with a dock, or on shore before we leave. The boat can take up to 7 guests, has dry and wet storage, radio, plenty of shade and seating in the back and front (see pic below). The backup plan should weather fail us is a local beach on St Thomas or St John and you would not be charged for the boat, just the regular officiant fee plus any site fees associated with the beach you choose. If you have a large group (over 20ppl) and want a yacht or larger boat please let me know and I can help you arrange that as St Thomas has many excellent luxury motor and sailing yachts. 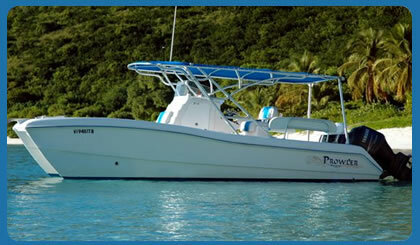 Pricing is typically $120+ person for the boat all day including drinks and lunch. ANYTHING YOU NEED JUST ASK! We are here to help make sure you have an excellent vacation. I can help with info on places to stay, the good places to go eat, rent a cars, excursions, the off the beaten path places to go, airport transportation, you name I am here to help.